In honor of F. Scott Fitzgerald, one of The Plaza's most famous patrons, and to celebrate Baz Luhrmann's film adaptation of The Great Gatsby, the Plaza invites you to experience the dramatic luxury of The Fitzgerald Suite. Designed by Academy Award® winner Catherine Martin, costume designer, production designer and co-producer of Baz Luhrmann's upcoming feature The Great Gatsby, the suite is a dramatic art deco space that channels the dynamism of the Jazz Age. The suite is furnished exclusively by RH, Restoration Hardware to reflect the luxury and style of the era, which captivated Fitzgerald and drew him to The Plaza, inspiring its inclusion in his great works. 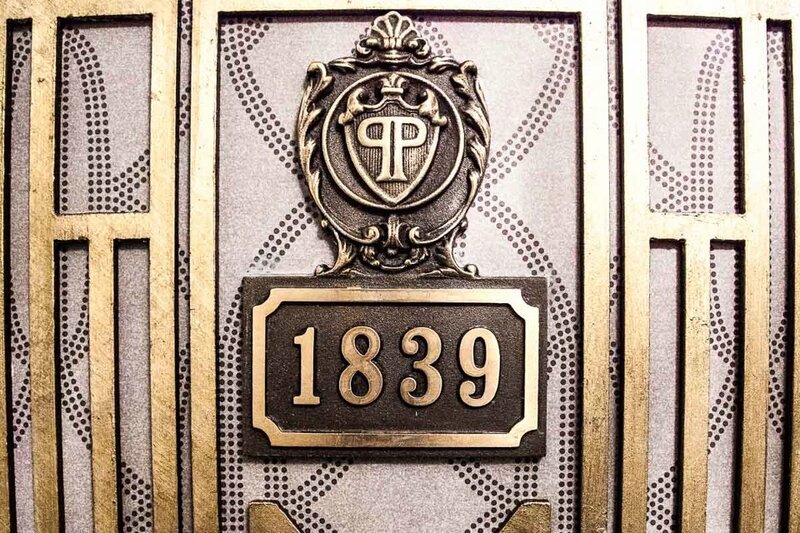 Every detail of the suite relates to Fitzgerald's life and his time at The Plaza as well as Baz Luhrmann’s film. Dome ceilings surrounded by antique mirrors feature 1920's Odeon Glass Fringe Chandeliers. The bedspread and towels are custom embroidered with the Jay Gatsby and Daisy-inspired monogram, seen frequently throughout the film. The walls are adorned with portraits of the 2013 film cast captured by legendary Hollywood photographer Douglas Kirkland, images of Fitzgerald and his wife, and 1920s photos from Vogue and Vanity Fair. Bookshelves are filled with the author’s complete works and books that inspired the filmmakers throughout production, as well as classic RH accessories that include vintage-inspired trophy urns modeled on a sporting prize from the 1920s, cast-iron Brooklyn Bridge bookends and timeless 1920s French Glass Cloches. Guests will also find entertainment in RH’s vintage board games, including Monopoly, which originated during the era, iconic Gramophone-shaped iPhone and iPad speakers, custom Tiffany & Co. playing cards, and coffee table books that invoke languorous summers on the Gold Coast or the vibrant New York of the Roaring Twenties. $50 credit for The Todd English Food Hall offering a modern menu of Gatsby-inspired cocktails curated by Hendrick’s Gin and a limited-time Brunch Like Gatsby weekend menu that features classic 1920s dishes with English’s signature contemporary twist. From $2,795 + tax per night. A minimum of 2 days advance reservation is required with a full non-refundable deposit due at time of booking. The Fitzgerald Suite can accommodate a maximum of two persons and does not accommodate a rollaway. Pets are not allowed in The Fitzgerald Suite. For reservations, please call 212-546-5235 or email ThePlazaFitzgeraldSuite@Fairmont.com. "I love New York on summer afternoons when everyone's away. There's something very sensuous about it - overripe, as if all sorts of funny fruits were going to fall into your hands."